The Queen Butterfly is related to the Monarch Butterfly and like its relative accumulates toxic chemicals in its body which makes it distasteful to predators. The butterfly is mainly a dark orange color with a black band around the outer wing (reminds me of the coloration found on those old Fender Stratocaster guitars with the tobacco sunburst finish) and has white spots around the outer edge of the forewing. has a black upper surface with a wide white band across the wing. The butterflies can be distinguished from the similar looking Soldier Butterflies by the line of white spots on the orange section of the forewing (called the forewing post median area). 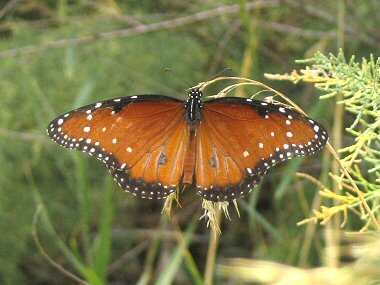 Often in the fall, large numbers of Queen Butterflies can be seen as they migrate southwards to Mexico through Texas. The butterflies range throughout the southwest and Mexico and they mainly prefer open areas such as grassy fields and roadsides. The major food plant for caterpillars is milkweed and milkweed vines.